Writen by: Juliana Schroeder and Nicholas Epley. When you’re trying to convey the quality of your mind to your boss, or to a company that’s considering you for a job, your best ally may be your own voice. 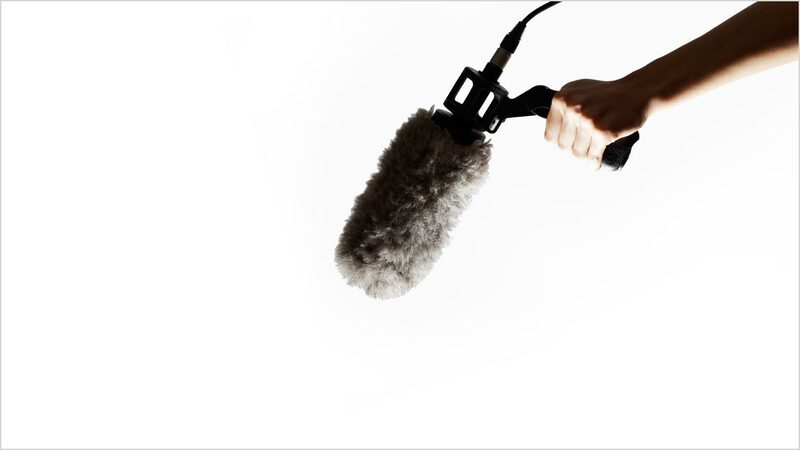 Although some people may assume that their ideas and intellect would come across much better in written form, it turns out that using your voice can make you sound smarter. This insight comes out of our broader research investigating how people discern what’s going on in others’ minds despite the fundamental human inability to directly observe another’s thoughts, beliefs, or motivations. We’ve learned that spoken language is a highly effective tool for this. It’s the communication form that most clearly reveals not only what people are thinking but also their thinking ability. That’s an insight worth pondering. After all, a significant part of your success in life depends on how you are evaluated by others. You may be smart and competent, but if your boss fails to realize it, you will not get your well-deserved raise. You may be the best candidate for an intellectually demanding job, but you won’t get hired unless your interviewer recognizes your ability. We discovered this through a series of experiments. One of them consisted of asking each of 18 MBA students in the middle of recruiting season to prepare a spoken pitch to their preferred employers explaining why they should be hired. (We also asked them to prepare a separate written pitch, which we used for a subsequent experiment.) We gave them as much time as they wanted to make their pitches as compelling as possible, and we videotaped the presentations so that we could evaluate the effect of both hearing and seeing the candidates. We then asked 162 evaluators to watch one video, listen to one audio pitch, or read a transcript (with filler words like “um” removed). The evaluators assessed the candidates’ competence, thoughtfulness, and intelligence and reported how much they liked them and how positive an impression they had made. Judgments like these are of fundamental importance for hiring decisions in sectors such as service, in which employers are searching for intelligent employees. Finally, the evaluators reported on how interested they would be in hiring the candidates if they were considering them for positions. In comparison with those who read the transcripts, the evaluators who heard pitches judged the candidates to have greater intellect (to be more rational, thoughtful, and intelligent), on average. They also liked the individuals more, had a more positive overall impression, and — perhaps most important — were more interested in hiring the candidates. Evaluators who saw the videos appeared to be even more favorably impressed, but there was no statistically significant difference between the evaluations of video and audio. Results like these may come as a surprise to many people. When we asked samples of MBA students, master’s degree students, local (Chicago) community members, and online participants to predict whether their intelligence would be judged more positively in speech or text, they expected no meaningful difference between the two. Faced with the question of how best to convey their intellect to a recruiter, providing a short typed pitch or an audio of the same words, roughly half (50 out of 112) of the MBA students we surveyed said they would prefer to provide a written pitch. Granted, a transcription of a spoken pitch might make for a less-than-compelling text, so we conducted another experiment to test whether the results of a written pitch would be similar to those of a transcript. 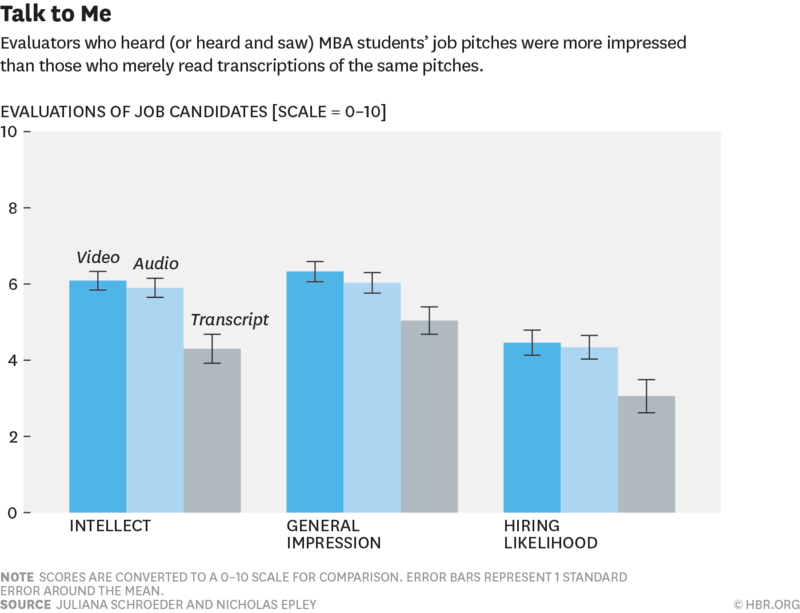 This experiment confirmed that a person’s mind is indeed conveyed through the voice: In comparison with either a transcript or a student’s carefully written pitch, a spoken pitch led to more positive impressions of candidates’ intellect and more hiring interest. You might wonder whether people who actually hire candidates for a living would show the same preference for candidates who speak. For ethical reasons, we could not manipulate real hiring decisions, but we could conduct our experiments with professional recruiters. After a conference, we asked 39 recruiters from companies such as Microsoft and Goldman Sachs either to listen to a candidate’s pitch or to read a transcript. On average, they too judged a candidate to be more intelligent, likable, and employable if they heard, rather than read, a pitch. Obviously there are many situations in which providing written text is the only option for communicating with superiors or recruiters. But it’s worth making the effort to bring your voice into the mix, and we believe it’s a good idea, when people are about to make decisions about you, to look for opportunities to chat on the phone or in person. Although there may be some advantages to putting thoughts in writing — it allows for revisions, for example — written passages lack critical paralinguistic cues that provide critical information about a speaker’s intelligence and thoughtfulness. Your voice is a tool that has been honed over the course of human evolution to communicate what’s on your mind to others. Without even thinking about it, you naturally flood your listener with cues to your thinking through subtle modulations in tone, pace, volume, and pitch. The listener, attuned to those modulations, naturally decodes these cues. That’s why if you claim to be passionate about your prospective job, for example, hearing your passion may be more convincing than reading your passion. Written text may not convey the same impression as your voice, because it lacks a critical feature: the sound of intellect.